Few music moguls have had as lasting an effect on popular culture as Motown founder Berry Gordy, whose accomplishments have earned him the Pioneer Award from the Songwriters Hall of Fame. Gordy will receive the award at the group's induction dinner June 13th in New York. "Berry Gordy is an innovator and a visionary," Jimmy Webb, chairman of the Songwriters Hall of Fame, said in a statement announcing the honor. "Yes, he created a label but more than that, he created a genre. Think about it, he pioneered a marketplace for African-American artistry and then he invited the world in to enjoy it. Berry was way ahead of his time; his young and immaculately groomed and dressed artists were among the first to receive media training. 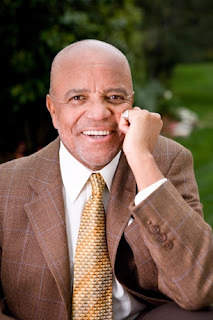 Berry Gordy and the Motown sound are essential to the American music story." The Pioneer Award is the latest in a long line of honors for Gordy, including an induction into the Rock and Roll Hall of Fame in 1988, the President's Merit Award from the Grammys in 2008 and a "Salute to Motown" evening at the White House in 2011. Gordy is also the subject of Motown: The Musical, a new Broadway production based on his life. Preview performances began this week, with an official opening to follow on April 14th. This year's inductees into the Songwriters Hall of Fame are Steven Tyler and Joe Perry of Aerosmith, Mick Jones and Lou Gramm of Foreigner, Holly Knight, JD Souther and Tony Hatch.